Remaking a Punk Classic from Memory Dirty Projectors' songs mix controlled cacophony and catchy melody. Those extremes dominate the band's new Rise Above, on which it attempts to reconstruct and remake Black Flag's 1981 album Damaged. Few would think to rework — or, in some sense, remake — a work as lauded and lambasted as Black Flag's 1981 album Damaged. When it was first released, Damaged was revolutionary, taking the furious energy of punk and heavy metal and approaching it with a harder edge. Black Flag's aggressive approach to social criticism and politically charged angst sparked widespread criticism of its lyrics, yet its experimental nature appealed to listeners and fellow musicians, who found the album groundbreaking and influential. 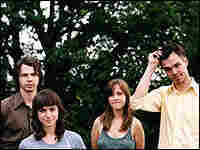 It certainly influenced The Dirty Projectors, led by prolific and eclectic singer-songwriter Dave Longstreth, whose approach to arranging seems like a strange mating dance of controlled cacophony and catchy melody. Those extremes dominate the group's new Rise Above — a deconstruction and reassembly of Damaged. Refraining from straightforward covers, Longstreth reportedly re-created the album from, as he puts it, "memory and intuition." The end result finds the songs all accounted for, yet with wildly reworked arrangements that force a double-take from even those most familiar with the original works. For fans of Damaged, it's hard not to marvel at the similarities while noticing the many differences. On the title track, as with much of the record, Longstreth neatly entangles crisp guitar playing, a chorus of female voices and a sturdy back beat, and takes the songs far away from punk and into less easily labeled territory. The song mixes the soaring vocal heroics of soul, the bite of '60s rock and subtle allusions to the dance grooves of Afrobeat, as Longstreth's voice channels Marvin Gaye and Bob Marley via Antony & The Johnsons. While both albums draw from difficult political eras, the music hardly feels hopeless or brooding, as The Dirty Projectors' reliance on pop helps couch the statements of Rise Above in optimism. Hearing this version, it's intriguing to hear the rage of Black Flag's original wash away and reveal more of a plea for change.